At 22, after earning my BA form UCLA in political science I obtained my real estate license, and managed commercial properties in downtown Los Angeles. I later earned an MBA from the University of Southern California where I studied real estate, finance, and entrepreneurial management. Employment in residential real estate, investment marketing and corporate administration followed over the succeeding decade. After graduation from University of Colorado with honors, Pat obtained a position with the Federal General Services Administration, where she was trained as a Federal Buildings Manager, and advanced to become a Real Estate Specialist. Her duties included the sale of surplus government property to states, cities, municipalities, and the private sector. She went on to become a Realtor in the greater Denver Metro area before moving to Sonoma. We began our real estate careers in the City of Sonoma working for a regional commercial brokerage. We shared an office together, competed for clients, and soon formed a partnership to leverage our respective talents. The experience we gained in the early years of our partnership — working such a broad array of property types and such a diverse clientele — became the foundation on which our successful real estate practice was built. Together we leased commercial buildings and sold residential homes, rural residential properties, investment properties and business opportunities. We married in 1992, celebrating our 21th wedding anniversary last October. For the past 29 years, we have been associated with Keegan & Coppin Co., Prudential California Realty, Frank Howard Allen Realtors, Coldwell Banker Residential Brokerage, and now Better Homes and Gardens Real Estate / The Wine Country Group. During this period, we have consistently ranked among the top performers of the companies we represented. Our commitment to our profession is demonstrated by our commitment to education. 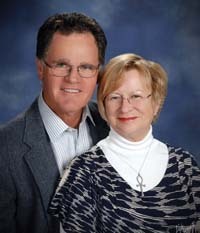 We have earned designations or certifications as Seniors Real Estate Specialist (SRES); Country Property Specialist; Eco-Green consultants; E-Pro specialist; Home Affordable Foreclosure Alternatives (HAFA) Specialist; and attend frequent seminars related to real estate practice, legal and tax issues, marketing innovation, and technological advancement. We participate actively in the community we serve. We assist the elderly or infirmed as volunteers with our local Meals-On-Wheels program. We support the American Cancer Society Relay for Life, local schools, non-profits, youth programs and our Chamber of Commerce through a variety of activities and contributions. The sale or purchase real estate involves many individual steps which need to be carefully coordinated. Our goal is to work with you and for you to complete these steps. Your questions and concerns will be addressed; all options will be explored; and any necessary investigations will be made. This website is designed to earn your trust and your business. We hope you find the information provided to by useful. Please contact us with any questions or comments on how we may be of service to you.